93 Minutes Of Mystical Woo-Woo-Ness!!! Get a copy of the wild call for yourself + notes. 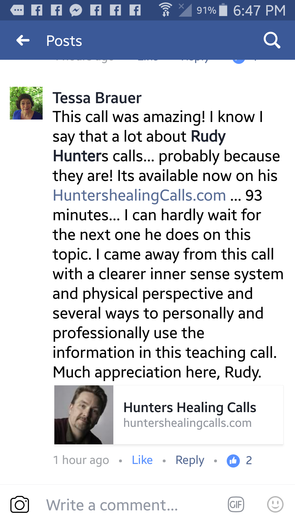 Ever wanted Rudy Hunter to teach you some super-cool healing stuff personally? Open to anyone who wants to learn more about the energetics of AcuPoints. Rudy discovered the world of AcuPoint when he was 14 years old [quite some time ago!] and has been on a rampage ever since. He has trained and taught 5 Element Theory to Acupuncturists but that was not enough. For YEARS he has obsessed and tested out ways to activate AcuPoints energetically without needles or equipment. He's beginning to teach this epic topic to his AshWorkers...but this event is not limited to just AshWorkers. It's open to anyone who wants to learn the energetic anatomy & mechanics of how these magical points work and can help us heal & feel better--fast. Note: This class will NOT teach any AshWork Skills. That's what the Basic & Advanced courses are for. You can, however, use any set of skills you currently know [including just focus, attention, gentle touch & prayer] with the AcuPoint approach Rudy will be teaching. 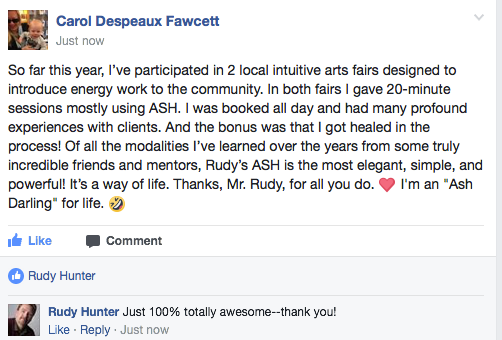 Up to you if you'd like to lean this now or later...but it is super-cool neat-o stuff NOT from manuals & charts but from direct energetic experience from Rudy working with individuals & groups for decades. There will be no usual EnergyWork per se on this call from Rudy...but he'll teach you a mountain of powerful ways to use AcuPoints energetically for yourself & others. from any other source either. Rudy will be teaching between 45 minutes to an hour. RUDY WENT WAY LONGER...93 MINUTES OF MYSTICAL, ENERGETIC WOO-WOO-NESS!!! THERE'S SOME REALLY COOL STUFF HE TAUGHT ON THIS CALL!!! Purchase the call + notes for $75.00 and download it right away. ​You won't want to miss these goodies! I want this cool stuff!!! ​that are decades in the making. ​in this presentation. Fun times & adult themes. Just so you know. The Acu-Points call was wonderful. left me feeling more balanced and aligned. how to use the acu-points together! such useful, practical and effective information. I’ve had occasion to use CV 17 and LV 3, and am grateful for the instant relief they have brought. Just putting my attention on CV 17 brings an expanded feeling all the way from throat to tummy, easing everyday stresses. Thank you for sharing your Acupoint techniques with me (us). I’ve been applying what I learned from your Acupoint lessons to my clients, friends and myself. This has been an easy process to pick up and utilize and the success rate of balance of self and releasing discomfort and emotions is HUGE. I’ve been doing ASH work on the intended areas and points as well, so the areas clean and clear up very, very quickly.